All the stats and facts from the fifty sixth match of IPL 2018 between Chennai Super Kings and Kings XI Punjab. 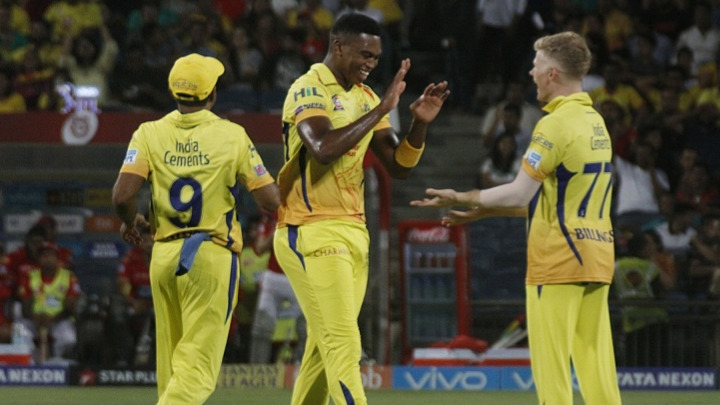 Chennai Super Kings registered their ninth win of IPL 2018 campaign and maintained their place at the second position on the points table after they defeated Kings XI Punjab by 5 wickets at the MCA Stadium, Pune in the last game of league stage. Chennai Super Kings, after winning the toss and opting to bowl first, bundled out Kings XI Punjab for 153 runs in the last over of the innings and chased down the target with 5 balls to spare. With this defeat Kings XI Punjab has been knocked out from the tournament. 4/10 - Lungi Ngidi's 4/10 are his best bowling figures in IPL as well as in T20 cricket. The previous best was 4/10 for Titans against Warriors at East London in 2017. 4/10 - Lungi Ngidi's spell of 4/10 (economy rate 2.5) is also the most economical spell in IPL 2018. 7 - KL Rahul got out for just 7 runs in this match and this was his first single-digit score in IPL 2018. 52 - Lungi Ngidi also completed 50 wickets in T20 format, he has taken 52 wickets at an average of 18.17 in 44 matches. 200 - Number of sixes Suresh Raina has hit for Chennai Super Kings in T20 format - the first Super Kings player to hit 200 T20 sixes. 216 - Number of dismissals made by MS Dhoni as a wicket keeper in T20 cricket - the most by any wicket keeper. He overtook Kamran Akmal's record (215) of most dismissals by a wicketkeeper in T20 format. 659 - KL Rahul scored 659 runs at an average of 54.91 and at a strike rate of 158.41 in 14 innings with 6 fifties in IPL 2018 - the most runs by a KXIP player in a single edition of IPL. 4007 - Runs MS Dhoni scored in the IPL - he became the 7th player to score 4000 runs in the IPL history after Virat Kohli, Suresh Raina, Rohit Sharma, Gautam Gambhir, David Warner and Robin Uthappa.